Knowing that the Fourth of July is America's biggest "dipping" holiday, Chobani aimed to generate buzz among consumers, media, and influencers around Chobani Meze Dips by bringing its new product's benefits to life in a completely immersive environment. Chobani celebrated its first step outside the yogurt aisle with new product Meze Dips by giving consumers the opportunity to stay in an edible house in New York over the Fourth of July weekend. The brand encouraged fans to enter a sweepstakes with a chance to win a four-night stay in the Chobani Meze House, which was inspired by the natural ingredients, real veggies, and globally-inspired flavors that make up the four new Chobani hummus dips. Chobani, primarily known as a yogurt brand, launched its first Greek yogurt product nine years ago. Knowing that the Fourth of July is America’s biggest "dipping" holiday, Chobani aimed to generate buzz among consumers, media, and influencers around Chobani Meze Dips by bringing the product benefits to life in a completely immersive environment. The campaign team began planning for the launch of the Meze home just two months prior to the sweepstakes kicking off. The Chobani Meze Home was designed with the help of local landscapers and chefs, seeking to combine culinary tradition, fresh produce, and beautiful design in one space. The home itself, which is a $12 million, three-story townhouse in Chelsea, contained more than 25 varieties of produce that serve as "edible spoons" for the new Chobani product. 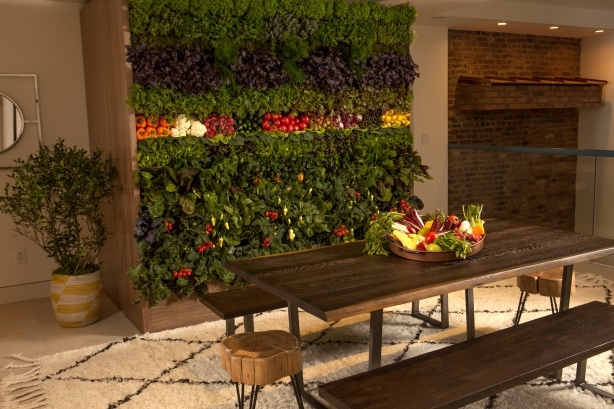 Major features include a floor-to-ceiling living wall of produce, as well as an indoor pool with floating gardens. Michael Gonda, Chobani’s VP of corporate comms, told PRWeek that the company is initially introducing the new dips to the deli section of the supermarket. "Our product we're introducing has 80% less fat and 65% fewer calories than the leading hummus," Gonda said. "The question comes down to: How do you present that and offer that to the world?" Chobani’s main goal with this campaign was to generate earned coverage, Gonda added. He explained that, at this stage of the product’s life cycle, awareness is important. "We wanted people to know about the product and what makes it special," he said. "A physical manifestation of that, a physical activation, helped create that beautiful design, display those natural ingredients, and to establish something that demonstrated shareability." A number of media outlets including food, travel, design, lifestyle, trade publications, broadcast, and various regional outlets throughout the U.S., were targeted to help spread the news of the Meze home and Chobani’s product portfolio expansion. To further drive conversation and encourage sales of the Chobani Meze Dips, the Meze home opened its doors on June 20 to a select group of national and local media, as well as several social media influencers from around the country. All attendees were offered one-on-one tours of the home and were invited to pick and dip "edible spoons" throughout the tour to try the new dips. As a national call to action, Chobani asked consumers to explain how they like to dip via a Chobani Meze Home microsite, and the brand’s Facebook and Twitter pages. On June 20, Chobani also announced that fans could use the microsite to enter a sweepstakes for a chance to stay in the house. In terms of the social elements of the campaign, Gonda noted that shareability was essential to ensure the new product has visibility across the country. "It wasn't just sharing the [Meze] home with fans, but rather sharing the idea with our fans," he said. "Social media added a huge component to that -- everything down from encouraging people to share on their own platforms to increase additional entries into the sweepstakes to using the content we were creating to share across Snapchat, Instagram, Facebook, and Twitter." The announcement of the Meze home marked Chobani’s top performing post on Facebook with over 118,000 likes. To date, the Meze home campaign has generated more than 300 million media impressions across social and traditional channels. The sweepstakes received nearly 10,000 entries, from June 20-24. The campaign has also received more than 400 earned media placements from various outlets including: The Daily Meal, BuzzFeed, Food Business News, Trend Hunter, FoodBev.com, and Drug Store News. A Facebook Live tour that Delish.com took in the home on June 21 has thus far garnered over 50,000 views.